This paper presents a new intertemporal general equilibrium model of the U. S. economy incorporating a detailed representation of U.S. tax structure. We employ the model to analyze the impact of fundamental tax reform on U.S. energy markets. More rapid economic growth would dominate energy conservation, leading to greater energy consumption and higher carbon emissions. Policies under consideration within the Climate Convention would impose CO2 controls on only a subset of nations. A model of economic growth and emissions, coupled to an analysis of the climate system, is used to explore the consequences of a sample proposal of this type. The results show how economic burdens are likely to be distributed among nations, how carbon "leakage" may counteract the reductions attained, and how policy costs may be influenced by emissions trading. We explore the sensitivity of results to uncertainty in key underlying assumptions, including the influence on economic impacts and on the policy contribution to long-term climate goals. 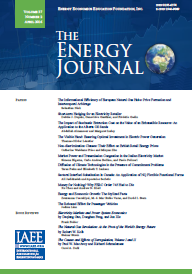 Evidence of market integration and price competition support a policy of price deregulation and open access in the electric power industry. The objective of this paper is to test the hypotheses that wholesale electricity submarkets in the Pacific Northwest region of the WSCC are integrated, and price competition exists within these integrated submarkets. To this end, we apply a bivariate cointegration test, a price-difference test and a causality test to the 1996 on-peak daily electricity prices off our submarkets in the Pacific Northwest of North America: Mid-Columbia and California-Oregon Border (COB) in the Western US, and BC/US Border and Alberta Power Pool in Western Canada. The price-difference test results support the hypothesis that the following pairs of markets are integrated: (a) BC/US Border and Mid-Columbia; (b) BC/US Border and COB; and (c) Mid-Columbia and COB. A comparison between the gross profit from price arbitrage and the posted transmission tariff indicates that price competition prevails in these market pairs, and the causality test results provide supporting evidence that price leadership does not exist in these three market pairs. Finally, a market-share analysis indicates that B. C. Hydro does not have market power in the aggregate market comprising BC/US Border, Mid-Columbia and COB. Pay-at-the-Pump (PATP) is a proposal for replacing the lump-sum payment of auto insurance by a system of surcharge on gasoline price. This study examines the main argument made against PATP-namely, that by stimulating the demand for fuel-efficient vehicles, PATP results in a drastic deterioration in highway safety. The study finds the evidence does not support this argument. Moreover, if as critics argue, PATP does indeed result in a substantially accelerated replacement of older vehicles with more fuel-efficient ones, the introduction of PATP may be expected to result in a substantially safer fleet of vehicles, as well.